Since 2014, every Miaw edition focused on a specific area, theme or question related with the architectural and urban transformation of Milan, so that the outcoming projects were a relevant contribution for a vision of the future city. In this edition 2018, Miaw studios will concentrate around some strategic urban areas, as part of the regeneration program of the peripheries, both in the sphere of academic research (Ri-formare Milano – Periferie), and political programming at the local, national (Piano delle Periferie), and international (C-40 Reinventing Cities) levels. 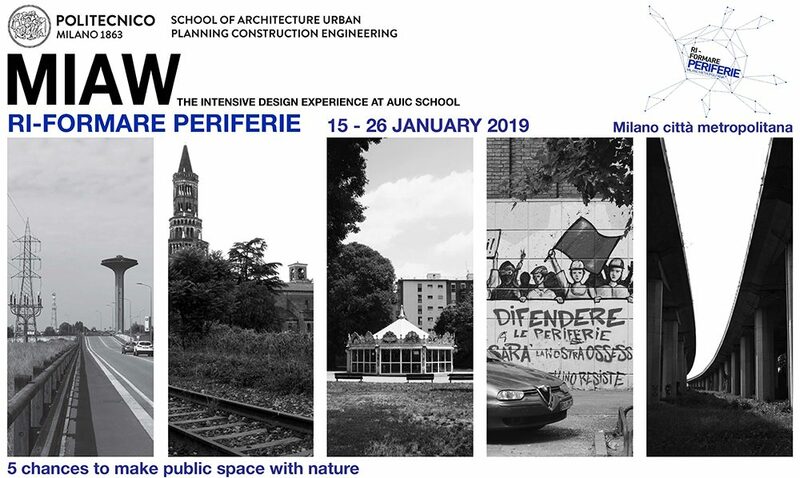 The general theme of this edition is “architecture in periphery”, and the question is “how can architecture improve public space and relations in places that suffer a lack of sociality, urbanity and formal order”. The role of public space − that belongs to and defines community life at a both real and symbolic level − has clearly taken center stage in the debate on the critical issues of the contemporary city, and will be central to the workshop program. The issues now affecting the development of urban space demonstrate the obsolescence of the traditional techniques and instruments of urban planning and design: the management of environments that are both physically and socially degraded is calling now for new solutions. A critical review with an experimental design approach to some of the established typologies of public architecture ( Libraries, Markets, Stations, etc.) can be used both as instruments for analysis and survey, and as a metaphorical base for the design construction of those public places where the memory of social life occurs and is layered. Guest architects will be asked to investigate In detail, possible future urban scenarios for these selected sites. After all, public space – and this urgent need for its construction – is the only term of the grammar of urban events that still has a possibility of elevating itself to an element of transformation and reform of the devastated territory of peripheries. 1 LUCAN J. (1993). Lo spazio urbano nell’era dell’individualismo. Urban spaces in the era of individualism. «Casabella» n. 597-598, pp. 77-79. This entry was posted in MIAW 2018 and tagged Alessandro Rocca, Filippo Orsini, Miaw 2018 by maria feller. Bookmark the permalink.